Sometimes expensive decisions are well worth the price tag. On March 1st, the day of the trade deadline, the New York Rangers acquired one of the most prized trade targets in the league, defenseman Keith Yandle, from the Arizona Coyotes. A powerplay quarterback that already has four 40-point seasons under his belt, Yandle is one of the best offensive defensemen in the league and his services were sought after by multiple different teams. To acquire him (along with Chris Summers and a 4th round pick) the Rangers had to part ways with a very hefty, impressive package of a 1st round pick, a 2nd round pick, defenseman John Moore and prospect Anthony Duclair. Both draft picks are high ones, while Moore already has over 200 games of NHL experience at the age of 24 and Duclair, 19, was a key member of the gold medal-winning Canadian team at this year’s World Junior Championships. Despite what they gave up, however, Yandle will be well worth the price if he can be what the Rangers are hoping that he can be: the final missing piece of a championship team. Before the trade deadline the Rangers were one of the best teams in the Eastern Conference, led by key veterans Henrik Lundqvist, Rick Nash and Martin St. Louis. The team was winning plenty, but having a hard time separating from the other top teams in the conference such as the Montreal Canadiens and the Tampa Bay Lightning. With talent and depth all throughout their lineup their only Achilles Heel was a lack of puck movement and offensive punch coming from their back end. Kevin Klein, who is not known for his offensive abilities but currently has 26 points in 65 games, was leading the blueline in scoring at the time. Ryan McDonagh and Dan Boyle had been manning the powerplay, but with only modest individual success. They have nine and seven points, respectively, so far this season on the man advantage. The 28 year-old defender racked up an impressive 26 powerplay points while playing for a struggling Coyotes club, and combining that with the one that he has so far with New York not only puts him 1st among all blueliners, but also in a tie for 7th in the entire NHL in that category. With only one powerplay point and four total points in ten games so far with the Rangers, the individual numbers haven’t been gaudy, but Yandle’s impact on the team can still be seen in the standings. 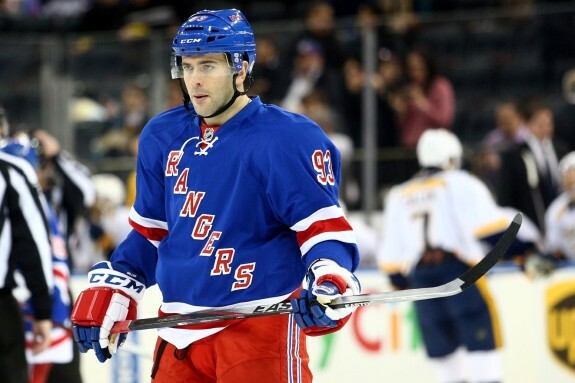 The Rangers have gone 8-1-1 since acquiring him, vaulting them into a three-way tie for 1st in the league. They also have the advantage of having two games in hand on Montreal, and three games in hand over the Anaheim Ducks. They’re moving the puck out of their zone and up the ice with much more ease than before and Yandle is logging big minutes in the process. He had his best game in New York thus far on Sunday night, netting three assists, four shots and a +3 rating in 20:41 of ice time as the Rangers shellacked the aforementioned Ducks by a score of 7-2, a huge statement victory for the team to have at this point in the year. There are still a few weeks left in the season, and a long, arduous playoffs still to come, but if the early returns are any indication then the Rangers’ decision to land Yandle could end up being one of the best that the organization has made in a very long time.